The website of historian and critically acclaimed author Paul Doherty gives information about his books, news and future events. If you wish to contact Paul for talks, events, interviews or would like to write to him please email him at: paulcdoherty@gmail.com. Paul is always happy to hear from readers and will always try to personally respond. May, 1381. 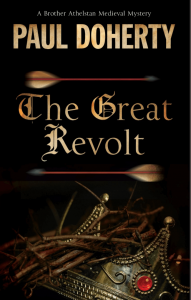 The Great Revolt draws ever nearer. The Upright Men openly roam the streets of London, waiting for the violence to begin. Their mysterious envoy, the Herald of Hell, appears at night all over the city, striking terror into the hearts of those who oppose them. But who is he? When his chancery clerk is found hanged in a notorious Southwark brothel, the ruthless Thibault, John of Gaunt’s Master of Secrets, summons Brother Athelstan to investigate. 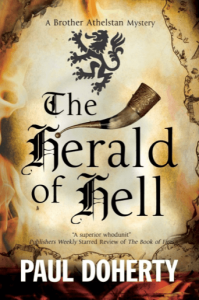 Did Amaury Whitfield really kill himself following a visit from the terrifying Herald of Hell? Athelstan is unconvinced. In the dead man’s possession was a manuscript containing a great secret which he had been striving to decipher. If he could only unlock the cipher and interpret the messages being carried to the so-called Herald of Hell, Athelstan would be one step closer to catching the killer. But can he crack the code before the Great Revolt begins? June, 1381. The rebel armies are massed outside London, determined to overturn both Crown and Church. The Regent, John of Gaunt, has headed north, leaving his nephew, the boy-king Richard II, unprotected. Brother Athelstan meanwhile has been summoned to the monastery at Blackfriars, tasked with solving the murder of his fellow priest, Brother Alberic, found stabbed to death in his locked chamber. Brother Athelstan would rather be protecting his parishioners at St Erconwald’s. Instead, he finds himself investigating a royal murder that took place fifty-four years earlier whilst the rebel leaders plot the present king’s destruction. What does the fate of the king’s great-grandfather, Edward II, have to do with the murder of Brother Alberic more than fifty years later? When he finds his own life under threat, Athelstan discovers that exposing past secrets can lead to present danger. July, 1381. The Great Revolt has been crushed; the king’s peace ruthlessly enforced. Brother Athelstan meanwhile is preparing for a pilgrimage to St Thomas a Becket’s shrine in Canterbury to give thanks for the wellbeing of his congregation after the violent rebellion. But preparations are disrupted when Athelstan is summoned to a modest house in Cheapside, scene of a brutal triple murder. One of the victims was the chief clerk of the Secret Chancery of John of Gaunt. Could this be an act of revenge by the Upright Men, those rebels who survived the Great Revolt? At the same time Athelstan is receiving menacing messages from an assassin who calls himself Azrael, the Angel of Death? Who is he – and why is he targeting a harmless monk? 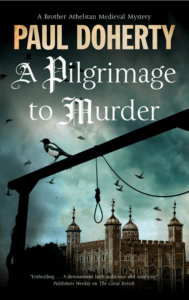 Could Athelstan’s pilgrimage be leading him into a deadly trap? After his recent unveiling of a devious assassin, Sir Hugh Corbett has returned to service as the Keeper of the Secret Seal, begrudgingly admitting that his appetite for adventure has once again been whetted. Summoned to meet the King to be congratulated on their work together, Corbett and Ranulf learn of the death of Corbett’s close friend, Ralph Grandison. Ralph, a leper, has been found dead in a rowing boat, a dagger thrust through his chest. But this murder is not the first of its kind. Other patients of the hospital in which Ralph was staying have similarly slaughtered and it seems as though the lepers, all former knights of the Royal household, are being targeted. 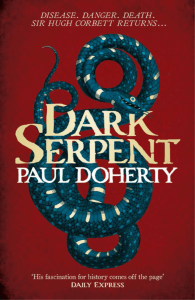 The discovery that Ralph was killed by no ordinary weapon, but a poison dagger that once belonged with the Crown Jewels before being famously stolen, leads Corbett down a complex path, where the risk of disease plays out against the backdrop of finding an assassin who will use any means necessary to kill. As Corbett puts himself in the path of extreme danger, will he survive to see another day? © 2019 Paul C Doherty. All rights reserved.